Circumstances over which we have no control prevent us from giving data relating to the only Belgian light 'plane shown at Berlin. This machine, a little parasol monoplane ДальшеMore>>> two-seater, arrived several days after the opening of the show, and when it did put in an appearance it was not in the form in which it had left Belgium. This was due to the fact that, owing to head winds, the machine had to alight in the dark on its way to Berlin, and in so doing damaged its undercarriage. At the I.L.A., therefore, it had an undercarriage which did not belong to it, and which was of somewhat old-fashioned type. This was explained to us by the Belgian representative of the stand, but it is to be feared that many visitors, unaware of the fact, received a less favourable impression of the machine than they would have done had it been shown with its proper undercarriage. 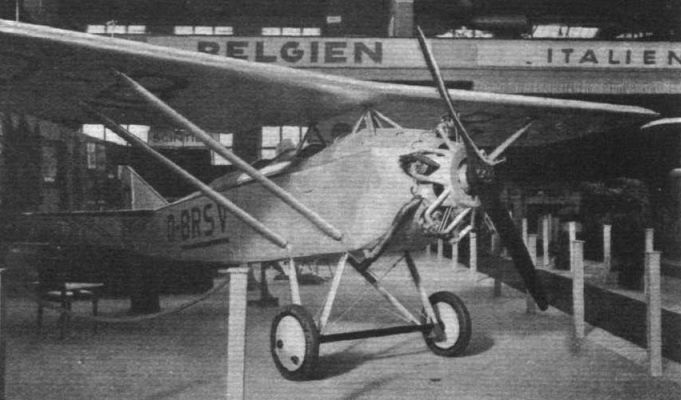 Unfortunately, no data were available relating to the Belgian light 'plane, beyond the fact that it was designed and built by Stampe and Vertongen, and that the price was ^600. The machine was somewhat like the Westland "Widgeon" in general appearance, with a parasol monoplane wing, strut-braced to the fuselage. The struts, however, did not meet at a point on the fuselage as in the "Widgeon," but were parallel. As there was no wire bracing in the plane of the struts, the task of retaining the wing always at right angles to the fuselage centre line (as seen in plan view) would have to be performed entirely by the small cabanes above the fuselage, and it seems likely that a certain amount of "play" must be present. Possibly, however, this is not sufficient to be of any great importance. The machine was of normal design and construction, and was stated to be extremely stable, also beyond the stall. The engine fitted was one of the Renard radial air cooled, the first of which to come under our notice were fitted in the Belgian light 'planes which took part in the Rotterdam meeting last summer. The Stampe and Vertongen light monoplane, with Renard engine, was exhibited at Berlin with a "jury" undercarriage, its own having been damaged in a night landing.